What would the stats be? or not if its knackered! Still works. As the last 20 minutes will testify. Hah, it's ages since I played that! Great fun but I feel sorry for Tharg as he performed woefully just now (captured just 3 of my cards, leaving me with a final score of 24,500). I could do with a real set of these for the boys... Hmm. I love this game. I'd love the droids at Rebellion to sort a new version of this. Ming: clearly, you need to make them out of Lego. Hah! Even I'm not that loony... (I've now ordered all the bits for D.R. & Quinch and Ace & Co. - probably my last builds for this year although unsurprisingly I've got a couple of other characters in mind now). 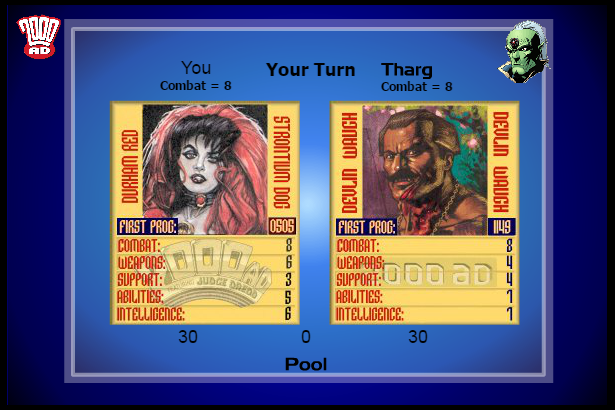 Anyway, physical 2000AD Top Trumps would be wonderful so please make it happen, Tharg. Thanks, Colin. I'd forgotten about that. My iPood doesn't know how to play it, but it works fine on my Windaes. I didn't now you could use the "first prog" stat line until Tharg used it against me. For the benefit of those without flash - the stats are as follows: prog (the only one where you want to aim low); combat; weapons; support; abilities; intelligence. Thanks. I tried accessing on Barney and couldn't get anywhere. I'm not very computer savvy! Nice! I'd buy a set of 2000ad Trumps but I do wonder how Durham Red outclasses Devlin Waugh? Red is a hard Drokker, certainly; but Devlin is a master of the Occult which surely must count for something? What I want to know is how many times the game had to be reloaded to get Vamp vs Vamp! Surely Devlin rates more intelligence than 1?